N269 Lorillard Mechanics Delight Bill Poole. A gangster and nativist political enforcer immortalized in Herbert Asbury's "The Gangs of New York" who was drawn on to create the "Butcher Bill" character in the movie. 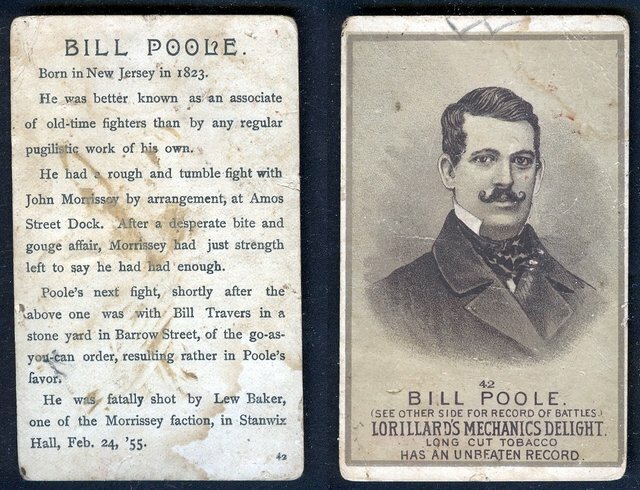 Murdered by Irish gangsters affiliated with John Morrissey (our next card subject), his last words were "I die a true American." His funeral procession drew thousands of onlookers.